Macrack is a leading Australian pallet racking manufacturer based in Brisbane. We build quality pallet racking systems from Australian steel at competitive prices. Our shelving systems are available Australia wide. Our manufacturing center is located in Mansfield. This means we can offer quality manufacturing, installation, and even auditing services to all of Brisbane and the surrounding area. This includes Brisbane North, South Brisbane, the Gold Coast and the Sunshine Coast. With over 30 years of experience in the warehouse and pallet racking industry, we are confident in the quality of each system we produce. And because of the proximity of our manufacturing facility, we provide racking manufacturing and installation services across Brisbane North. Our free quote and design plan offer extends to all of North Brisbane including Narangba, Virginia, Brisbane Airport, Brendale and New Stead. That means that one of our representatives can come out to your warehouse, take measurements and design a racking plan and quote for you for free. To take advantage of our quote and design offer, call 1800 048 821 to speak with one of our pallet racking Brisbane specialists. Based in Mansfield, Macrack offer warehouse racking services to all of South Brisbane including; Yatala, Acacia Ridge, Archerfield, Richlands, Coorparoo, Wacol, Carole Park, Capalaba, Coopers Plains, Logan, Macgregor. We also service the neighbouring cities of Ipswich, Logan and the Redlands. Don’t wait months or even weeks to have your new pallet racking system imported. Macrack builds all of our warehouse racking systems right here in Brisbane. We always have a stockpile of pallet racking on hand at our local manufacturing facility. We can even custom build a system for you in the time it would take for another company to get their systems into a shipping container. And with our lifetime guarantee on all of our pallet racking systems, you’ll never have to replace them. If you’re looking for quality Australian made warehouse storage that will stand the test of time, choose Macrack! Just 40 minutes north of Helensvale, our quality racking services extend right through to the Gold Coast. Including all of the surrounding areas such as Yatala, Coomera and Burleigh Heads. If you’re looking for quality warehouse storage solutions in the Gold Coast, Macrack is the solution. Each of our pallet racking systems is manufactured from high-quality Australian steel. Each racking system is built from cold-rolled, pre-galvanised frames that will never rust! That’s why Macrack is your local pallet racking expert. Our racking and installations are not limited to Brisbane North. We also provide customised warehouse storage solutions to the Sunshine Coast. From Caloundra and Buderim to Coolum Beach, if you have a storage problem, talk to your local experts at Macrack. Not only do we manufacture pallet racking that can be custom made to suit your business, we build warehouse mezzanine floors that are high quality and low cost. With mezzanine floors that could increase your storage capacity by over 100%, we have the storage system perfect for your warehouse. Macrack provides quality pallet racking and installations to all of the industrial parks mentioned below. If you need reliable racking systems at affordable prices, we have the solution. 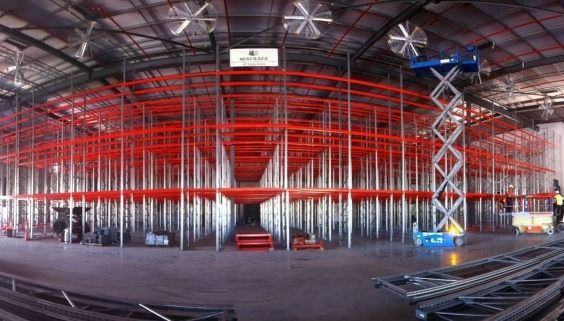 Call Macrack today on 1800 048 821 to claim your free pallet racking quote and warehouse design plan.